neatly skillful and quick in one's movements. "a deft piece of footwork"
"the script was both deft and literate"
As I set about weaving the place mat warp this morning the phrase "a deft hand" suddenly popped into my head. I had been background thinking about teaching and communicating about the skills involved in weaving - or any craft, for that matter - and suddenly this phrase appeared in my thoughts. Checking the definition, just to make sure it meant what I thought it meant, I saw an older meaning - gentle. And that rang another little bell. Because to me, working in traditional crafts means not only know how to do it, but how much finesse is required to get the materials to perform to their best. Recently someone asked me how I dealt with being treated as an 'expert' when you don't actually 'know it all'. To me, being an 'expert' doesn't mean that you 'know it all'. When it comes to textiles, it would be near impossible for one person to know everything there is to know about weaving. But I have studied certain aspects of weaving in depth. So when people ask me about something I haven't tried, or don't feel I know to the sort of level of expertise that would allow me to give a meaningful answer, I tell them I don't know, cite references if I know of any, and then tell them how I would approach finding out. In other words, sampling. While I may be 'deft', I am not the end of the discussion by any means. But I do know enough to point people in the general direction I feel they may discover the answers they are looking for. So perhaps I'm 'deft' at dodging the term 'expert'? Normally I weave on the AVL pretty reguarly. Unfortunately with the way Life Happened over the last six months, I barely got to the studio, never mind the AVL. Since the AVL is a wooden 'machine' with lots of added bells and whistles, it needs maintenance. When I'm weaving on it during the winter, I run a humidifier to prevent the build up of static charge in the warp. As a consequence, the additional humidity keeps the wood from drying out and shrinking. Since I didn't get to the loom for months, the humidifier didn't run and consequently...the wood dried out. And shrank. Significantly. When I sat down to the loom earlier this month, the loom frame had gaps where one piece of wood met another. The first order of business was to go round the loom and snug all those loose 'joints' tight. I couldn't reach all the bolts, but figured I'd gotten the worse culprits. Except that shaft two started dropping when it was supposed to be up. It was reasonably noticable, but it meant I had to back up, make sure two was up, then throw the pick again. If it was just once in a while, I just fixed things. But over the past few days it had been getting more frequent. When I quit weaving last night I determined I needed to deal with the situation. Forgetting that I was in the 'middle' of a panel. So I checked the sweep arm, loosened the bolt at the 'elbow', re-positioned the arm a wee bit, which is usually all it takes. But it kept happening. So I checked and sure enough, the bolts holding the sweep arm to the loom itself were also loose. So, back to re-positioning, then tightening those bolts. Now shaft one wasn't rising. At all. So I messed with it until I got some light into the dobby head and realized that in the act of re-positioning the sweep arm, the cable for one had popped out of the 'finger' altogether. No wonder it wasn't going anywhere! By that time I'd given up on getting a usable panel. What the hey - they are eventually all going to get cut apart into towel blanks. I've just gotten a head start, right? So, resetting the dobby chain to '1' allowed me some room to make sure everything was behaving properly before starting on the next towel. That blue bit in between the pink and yellow is my 'practice' area - you can see how badly the loom was behaving before I got things re-adjusted. The yellow is the new cut line. And that turquoise towel is now done. Nancy T included this summary of the experience doing Olds Master Weaving class as part of her homework. I asked if she would allow me to post it to my blog. This has been a journey of learning, disappointment, achievement and frustration. Weaving with wool was my first challenge as I had never woven with wool until I arrived in Olds. I thought the comparative book report would be the death of me; I seemed to get over that hurdle, then there was the weaving. My next plan of attack was to wind one warp 8 yards long which would weave 2 yards of plain weave and two yards of twill along with the six sett samples. I found a very nice Peruvian wool, which I enjoyed working with. I was very pleased with the sett samples, and the 2 yards of plain weave. With a square at my side I wove and measured and unwove and rewove and remeasured, cut off samples, washed samples, resleyed, wove, measured, unwove as I tried to achieve a 45 degree angle for the 2 yards of twill. I was at the point of settling or declaring defeat and walking away from the remainder of the homework. So I settled and that is what I submitted. 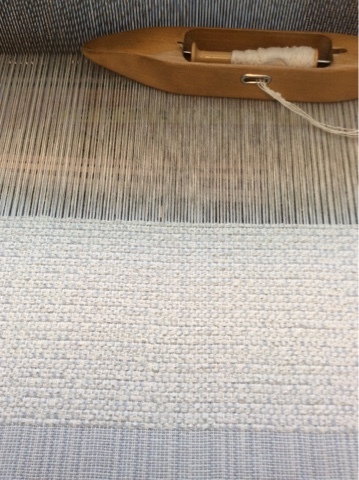 With my remaining warp I moved on to the weft faced sample which I wove 3 times and was satisfied with the third sample. 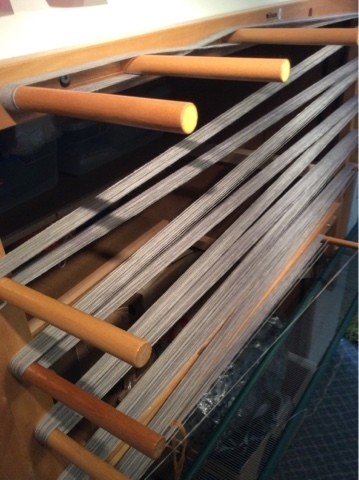 Finally I reached the warp faced sample; only to discover that I couldn’t get an open shed as the friction of the yarn that was sleyed and threaded so closely together was impossible to pry apart. I tried this sample with a reed and without a reed and was unsuccessful. I was very discouraged as I would have to start again with the sett sample exercise using a different yarn as the instructions indicated that the same yarn was to be used for all sett samples. I had woven beautiful samples that I couldn’t use, I was disappointed. I decided to change gears and weave the value gamp. I thought the book report was bad, how hard can it be to weave a value gamp? It was as if I had never woven a thing in my life. My edges were so bad, they were like nothing I have ever woven. After weaving samples and finishing them it appeared I had figured out the sett and ppi and was ready to go. Again I couldn’t master the final product to achieve 2 inch squares so I settled, not pleased with my work again it was decision time to continue or declare defeat. I dusted myself off and thought I’d better see if I can achieve a warp faced sample using the remaining warp from my value gamp. A true test to myself to achieve this weave structure would be to use the rust yarn for the weft in a warp that contained the six colors of my value gamp. I did it!! Finally there was something positive to build on so I would wind another warp to redo the sett samples along with the weft faced sample. 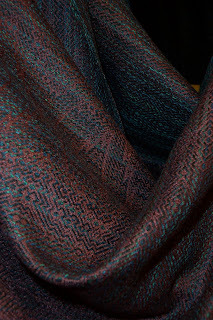 As I worked through the sett samples I liked what I saw with the colors which got me thinking of the final project which I had decided long ago, it would be a scarf. Through the finishing of the sett samples I was pleased with the hand and drape of the 9 e.p.i. so I was quite sure that would be the sett I would use for my scarf. One additional sample was woven at 10 e.p.i. just to confirm that 9 e.p.i. was what I wanted, and it was so I completed my final scarf project. I’m very happy that I have become very proficient and oh so comfortable in threading, resleying and dressing looms. I have learned so much throughout this journey. I’ve learned how to place yarn instead of beat it, how lightly dyed yarns have more spring than darker dyed yarns which was most likely the reason for the uneven tension in my value gamp; about keeping better records, what fibres can and can’t do and how they react when finished; what I can and cannot achieve, how determined I am to continue and hopefully succeed, and how important it is to weave with your heart. Nothing that I have woven throughout this journey was done by my heart (with the exception of my final project) it was woven with a tape measure and square being used every ½ inch to see if I was on track and if not it was unwoven. I’m sure I unwove just as much as I wove. When it was time to weave my final project, and with the luxury of it being my own design, I put all that I learned into play but with no “rules” I wove the scarf with rhythm and enjoyment and most of all the way I like to weave, from my heart, it was a joy to weave and I am very pleased with my final product. Without the support of a fellow classmate I’m not sure I would have made it to the end. Through all of the trials and tribulations I was never turned off of weaving, to which I am thankful and happy. I’m looking forward to weaving my next project using all that I have learned and once again weave from my heart. At the end of it all I am looking forward to returning to Olds to take the Level 2 course. It looks like interested students will have to create an 'account' before they can register. Although the course description is not on the website, it differs only in that a) the class runs in Prince George for six days, not five, and b) the maximum is 10 not 12. The classes here are six days, not five, with a maximum of 10 students. They will be held in the guild room, and some floor looms are available for the use of the students. The guild room is fully furnished, has a/c, a small fridge, tables, chairs, bobbin winders, warping boards and a mill. Shuttles are available, but best to bring your own as well as bobbins. 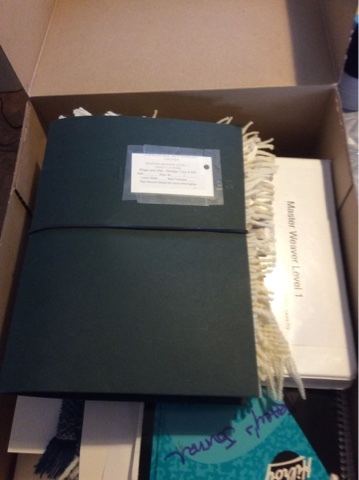 Otherwise, bring the usual sort of things - binder, paper including graph paper or laptop with weaving software, scissors, measuring tape, pins, etc. If you are from out of town, there are hotels/motels nearby - a five minute or so walk - more further away. There are also restaurants at most of the motels or bring a lunch. The room can be open in the evenings - I usually return to the room for an hour or so after dinner to answer questions. While this isn't the first box of homework from the Olds class (in Olds) it is the first of this year. I'm feeling weary right now so probably won't do more than just go through it, and then really start on it tomorrow. I like to get an over view of what has been sent in, then read through the written work and get a feel for the progress the student has made on this journey. I think level one is hard for a number of reasons. It is not like a weaving workshop - the aims and objectives are different, for one thing. It is perhaps more challenging in some ways partly because the goal is to bring a consistency to the learning of the craft. The graduates of this program should all have similar basic foundations of knowledge because they are all working to the same curriculum. Will they know everything there is to know at the end? No. Not at all. But they should have achieved the ability to think critically about the craft and their approach to achieving their intended cloth. They should be able to think through how to approach an area that they may not have encountered before. They should be able to bring creative solutions to difficulties they may encounter. They should be able to understand the basic principles of the craft, understand their equipment and materials and how and when to use the various tools. As an instructor it is also challenging for me, too. I have to follow the curriculum and ensure everyone understands it. I need to give them the tools to go further on their own. I need to allow them to make mistakes and learn from them. I must not spoon feed them information, but encourage them to seek answers for themselves. Because sometimes my answers will not be theirs. Change one thing, and everything can change. Registration for Fibre Week will begin on March 1. Registration for the satellite program in Cape Breton is open now. Last I heard there were just five places left. Registration for the satellite program in Prince George should be available on the website by the end of next week, possibly earlier. Classes at Yadkin are taking registrations now. The past year has been so stressful with one thing after another I find myself completely derailed. I find no appetite for doing what needs doing, so I am procrastinating by doing things that really aren't very high on my to-be-done list, but need doing at some point. So today, instead of firing up the AVL and working on that 60 yard warp there, I am winding place mat warps. Because I will need some of them for this fall, and why not begin now? The AVL will wait, after all. I have many tools in my studio, mostly because they provide a savings of time in some way. 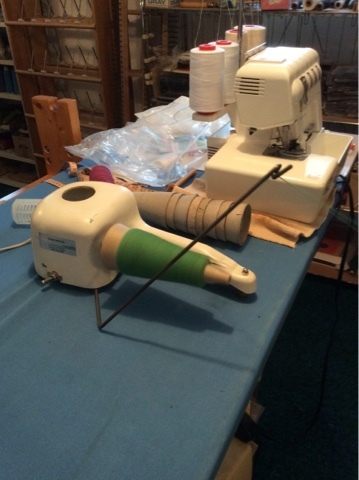 An electrical bobbin winder makes winding bobbins faster. I bought one when I realized it was taking longer to wind a bobbin by hand than it was taking to weave it off. This is a Silver Needles cone winder. I much prefer to use yarn from a cone than a ball. For a while I was working a lot with skeins of yarn, and getting them into a package that didn't provide a lot of problems was making working with that yarn a chore. So when I first heard about the Silver Needles cone winder, I bought one right away. It was a bit pricey (between exchange rate and shipping, it was even more expensive), but the ability to quickly and relatively trouble free process of getting skeins onto cones makes the purchase well worth while. My original cone winder was getting very worn out. I do, after all, use it a lot and parts wear. Then I heard that the company was back in business making the winders again. I thought long and hard about buying another one because really, how much longer am I going to be doing this? Well, as it happens, I hope for a good while longer. The yarn I wound today is for a research project and is a hand spun singles wool, fairly fine. I was able to get all of the skeins wound this afternoon with no muss, no fuss. The combination of winder and squirrel cage swift makes getting skeins onto cones a piece of cake, as they say. 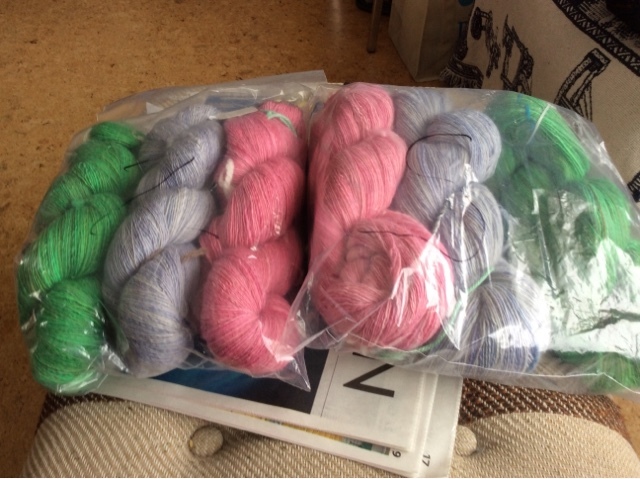 Because I don't have enough yarn. Or things to do. Or knowledge. Sometimes I see or hear comments about not using hand spun for weaving. Or, you can use it, but only plyed. Which is completely contradictory to the historical record. I have used both commercially and hand spun yarns for warp and weft. Some yarns are more tender than others and may require sizing to add strength. But yes, you can weave with hand spun singles. After extensive consultation with a master spinner and multiple samples, I now have the yarn to make 'something' - in this case three scarves - one for the dyer, one for the spinner, one for me. The spinner and I drew on our respective personal database of knowledge, consulted extensively, then she set about making samples of the hand spun singles which I then wove. Because that is how you find out if your extrapolations are correct - you sample. Change one thing and everything can change. People sometimes ask me if I sample any more. The answer is, as so often, it depends. I now have an extensive pool of knowledge to draw upon, and frequently I will not make a sample when I am working with known yarns using a known weave structure. But when I get a new-to-me yarn, yes, I sample. 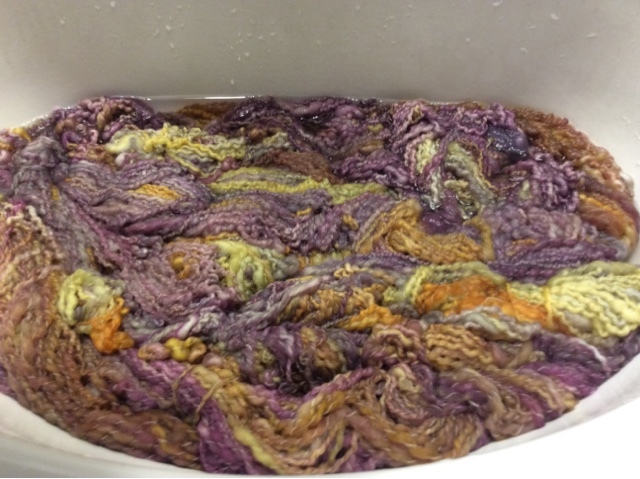 That is how I find out the limitations of the yarn, and the hidden beauty that may be revealed in the process...including wet finishing. Working with other fibre workers with complementary skills means that we all benefit. I don't have the technical skills to make such a consistent yarn (in thickness, in twists per inch), and she doesn't (yet) have my weaving skills. The dyer contributed by making yarn colours to our taste and that means that all three scarves are different colours, not all natural white. By working together we learn a lot more, a lot faster, than if we had each tried to do this exploration from beginning to end. I try to not use the forum of this blog for political comment. Recent events have made that increasingly difficult. I am an old white woman living in Canada. That gives me certain...privileges...that others do not share. I also happen to be liberal leaning in my politics. Recently a female politician in the United States was shut down from entering into the record a letter written by Coretta King. She was prevented from reading the letter, and in fact barred from further discussion on the topic at hand. The explanation given was that she was warned, given an explanation, but that she persisted. All of which wouldn't mean overly much except that several men then went on to read the same letter without censure. Since then the hashtag #shepersisted has gained traction, partly as an expression of the inequality seen in the actions of a women vs several men. Partly as a rallying call. But #shepersisted applies to so many layers of human endeavour. Dreaming a dream, then persisting in making it happen. Accepting that failure is not the end but persisting through the failure(s) to success. Being beaten down by the events of life, but getting back up and persisting in putting one foot in front of the other. #shepersisted is, to me, not just a political rallying point, but a maxim for living. Over and over again events will conspire against what we want to accomplish. If ever once we give up, then we have truly 'lost'. Persisting in the face of discouragement (sometimes from those nearest and dearest to us), persisting in the face of physical challenges (recovering from surgery, chemo, etc., etc.,) persisting in the face of societies quashing of our dreams. Women - and men - have persisted in the face of discouragement, blocking, derision, bullying. By persistently working towards their goals, they have given great gifts to humanity - in some cases - to themselves - in others. Living a fulfilling life, a meaningful life, sometimes means going against the grain of societal boundaries. But without that persistence, we would all be poorer for it. And all because I persisted. What is a 'master' weaver? Does s/he create 'perfect' textiles, every single time? 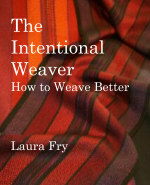 A master weaver is someone who understands their materials, understands how their equipment works, understands how to work ergonomically in order to reduce stress on their bodies, understands the basic weave structures and can manipulate all of the above in order to achieve - as closely as humanly possible - the results they desire. In order to increase proficiency, practitioners need to push boundaries, and at times, fail. Failure defines the limits of what they are doing and if they can achieve their goals following that path or if they need to tweak their approach in some way. There are ways to test ones proficiency - there are testing programs administered by the Guild of Canadian Weavers and Handweavers Guild of America as well as some guilds. These programs are a way to find out if the person knows what they think they know. They are also useful for pushing the candidate to perhaps explore things they might not have on their own, mainly because those things don't particularly interest them. Then there are learning/teaching programs. The one I am most familiar with is the Olds College Master Weaver course. The program has been growing, and it will now be hosted in Cape Breton at the Gaelic College June 5-9. 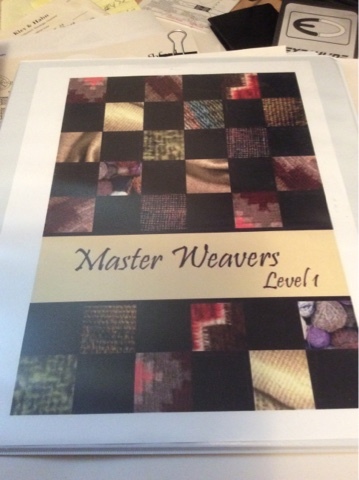 Teaching level one means I get to introduce weavers to the concept of mastering the craft. The course is not one where the student walks into the classroom, gets given the information they need to pass, executes that information, then goes on to the next level. That is not mastering, that is teaching to the test. Students are given challenges and encouraged to explore the possibilities in order to increase their own personal database of information, to push their boundaries, even to the point of 'failure' in some cases. They must document what they do and extrapolate from their experiences. They must analyze their results and draw conclusions. I would like to see the craft remain healthy and robust. In order for that to happen, weavers must learn facts, not myths. They must learn to think for themselves. They must get comfortable with not being 'perfect'. They must learn the limits and tolerances of the tools and materials. And when something is 'good enough'. I really hope that the college will announce the classes here in Prince George soon as I know people need time to book time off from work or family obligations. They are working on it, and early reports say that they should be available on the web site for registration this year. As I think about travelling to teach, I can only sigh. So many things I will miss when I stop; so many things that I won't. I will miss very much meeting people across the country who are as 'warped' as I am. I will miss talking to them about our shared passion. I will miss the light going on in their eyes as they grasp a new concept. I will not miss many other things. The 6 am flights, meaning I have to get up at 4 am. Or earlier. With the new, more stringent security requirements, our little airport also requires people to check in an hour ahead of the flight instead of 30 minutes. I will not miss trying to fit several topics into just one suitcase, trying to keep the weight well below the 50 pound maximum. Not just for the airline workers, but for the sake of my own back, which is also aging. 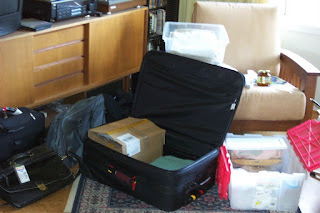 I will not miss the up to two days of prep for each workshop, trying to find boxes to use to mail out yarns/drafts. Or buying yet more padded envelopes. I will not miss standing in line at the post office with a fistful of forms for the parcels, which I try to fill out at home (which saves time at the counter). I will not miss the stress of travel, wondering which of the many flights I take will be late, causing a domino effect for all the rest. I will not miss sleeping in multiple 'strange' beds. I will not miss having to explain over and over again about my dietary requirements. No, a little bit is not acceptable, if people want me to function at any sort of level. I will miss the income. Of course I will. On the other hand, I won't miss paying for all the expenses of travel up front, waiting for reimbursement until I arrive. I won't miss trying to dig up additional dates around one guild's inquiry in order to keep my travel expenses more affordable. And then having one or more cancel, leaving the rest of the 'tour' a mess for me to deal with in terms of finding somewhere to stay and how to get from point A to point C, because B has pulled out. I won't miss the time and effort it takes to make all these arrangements when I could be weaving. After 40 plus years of weaving, teaching and writing about weaving, I am now in a position where I can pick and choose what I do. That gives me a lot more freedom, even if it does mean I miss a lot in the process. The colours in these skeins are actually more intense than shown in the photo. Many people don't know that I became a weaver because I started spinning. (Read the first few blog posts from Aug, 2008 for the story.) Over the past few years with one health issue after another, plus the universe dropping spinning wheels in my lap, I decided it must be time to start spinning again. Looking for the wheel of my dreams, I settled on a Canadian production wheel, fondly referred to as Larry (because it was made by Laurent, probably in the late 1800's, early 1900's). My preferred spinning method is supported long draw and my preferred fibre preparation is rolags. So recently I bought a blending board and I took a couple of braids of roving that had been given to me, added a wee bit of cashmere I got last summer, and between the two braids I think there will be just enough yarn for another shawl. Spinning yarn has allowed my currently spinning brain to calm and centre itself. Between my mother's illness and death and the political climate, I have felt awash with emotions. My house is now officially a valid entry in the 'reality' tv program Hoarders, with goat trails throughout, both upstairs and down. I'm used to the situation in the studio and have been working on stash reduction and trying to get my stash better organized, partially so that I can find stuff in order to get it used up. But now the upstairs is heaped with excess studio stuff that ought to be in the annex, and hopefully will be again soon, plus things from mom's apartment that we decided to keep. We are still finding things that need finer sorting with a final decision on keeping, passing on to family members, giving away (thrift shop) or simply tossing. But at this point I am exhausted, physically and emotionally. Surveying the heaps of rubble, it is patently obvious I need to make some decisions. I turn 67 this year. I have no kids to clean up after me. I have books, files, woven examples to use in teaching. If I were to either stop teaching altogether, or at the very least, curtail teaching, I could actually get rid of a lot of these things. With the renovations to the exterior of the house, the domino effect now decrees we need to upgrade the interior. The two small bedrooms are in dire need of new floors and painting, but there is no where to put the contents of those rooms, especially now. So we have decided to hire a storage bin to sit in the driveway, pack up the room contents so that the floors can be re-done and the walls painted. But that won't - can't - happen this year; it will have to wait until next. My plan is to start digging into the contents of my office over next winter and make some final decisions about things like teaching, now, so that there is less rubble to pack up and move to the storage bin. And hopefully make my office less of a royal mess and more pleasant to work in. Preliminary decision on teaching is that I will focus my efforts on the Olds classes. (I reserve the right to accept offers for fibre events, should they be forthcoming.) I am still waiting for confirmation of the satellite classes here and in Cape Breton but it looks like I will be teaching at Olds Fibre Week again. Once my life gets more settled and I finish with the manuscript for The Intentional Weaver (currently waiting for the latest round of edits to come back from the beta readers), I may turn more of my attention to writing. If I can eliminate everything but the Olds program, I can clear off at least two shelves in my office of the binders supporting those workshops, and several bins full of woven samples taking up space in my studio. The physical/emotional stress of setting up teaching tours, getting all the documentation for multiple topics sent out, the pounds of yarn I store for the different topics that I mail out to the guilds, not to mention the 6 am flights, worrying about my funky diet while I travel, etc., etc. All could be consigned to history. I need to find some calm in my life. There isn't much left - statistically speaking - nor do I have the energy to sustain the schedule I have kept over most of my career. I'm tired. I'd like to do some of the things I've always dreamed of doing - travel, for one - while I still can. Teaching doesn't have to be done in person. I can do it via the written word, plus there is the internet and video clips. Or people can come to me. As you can see, I'm going to be very very busy in May and June. One of the things I did last year (maybe the year before!) was wind a bunch of rayon chenille scarf warps. I managed to weave off a few of them, but there were seven warps, sitting in their boxes waiting, patiently. In an effort to reduce rubble, I decided to weave them off. So far, so good. 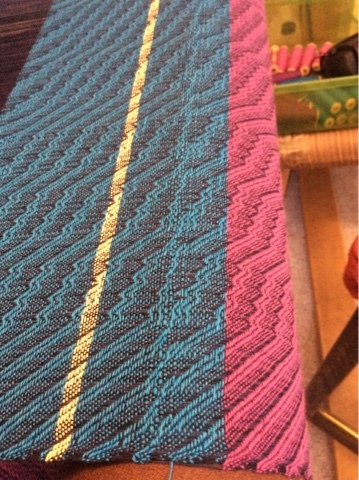 I think once the one currently in the loom is woven, there are just two left to do. 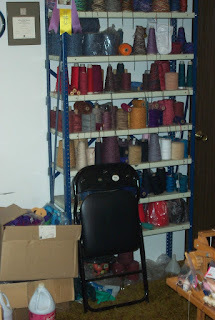 Unfortunately, I have lots more rayon chenille. About 50 or so pounds of it. The shelving unit is full, plus the two boxes on the floor, plus the boxes that are not in this photo. However, there are still 60 yards of warp left on the AVL and I'd really like to get them finished. The panels need to be done for the conference in Victoria the end of June, and I'm heading into a very busy teaching schedule in May/June, with homework from the Olds students beginning to arrive very soon. So, as soon as I finish off the pre-wound chenille warps, I will fire up the AVL and see if it is in a snit having been ignored for so many months.